Real Madrid striker Karim Benzema lost his footing at a vital moment during his team’s shocking 4-1 defeat in Europe at the hands of Ajax. The defending Champions League winners crashed out of this year’s competition after a thrashing at Santiago Bernabeu, with the final aggregate score reading 5-3 in favour of the Dutch giants. Hakim Ziyech, David Neres, Dusan Tadic and Lasse Schone scored the goals for the visitors, while Marco Asensio grabbed a consolation goal for Los Blancos on a nightmare evening for the home side. 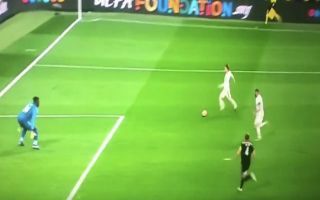 Benzema’s shocking slip when through on goal late on summed up Madrid’s awful display, as he missed the chance to covert a Luka Modric square ball in the box with the goal at his mercy. Check out a clip of the embarrassing moment below, via Twitter.